(LWI) – There have been heated discussions during the past years about whether the Paulinum in Leipzig (Germany) is a church or “only” a hall for University events and ceremonies. The newly built Paulinum was erected on the premises of the former St. Paul’s Church that was blown up in 1968 by the East German regime. The first Sunday of Advent saw the consecration of this building, that stands at the interface of religion and science. The “Paulinum – Auditorium and University Church of St Paul” is part of Leipzig University. It was erected between 2007 and 2017 on plans designed by the Dutch architect Erick van Egeraat. All university buildings apart from St. Paul’s Church were severely damaged during the bombing in 1943, but partly repaired again after the Second World War. Although St. Paul‘s University Church suffered only slight damage in the war, for political reasons the East German regime decided to finish the job and blow it up. It was destroyed completely on 30 May 1968, after part of its inventory had been taken to safety. Now, after almost 50 years, the newly erected Paulinum was consecrated on the first weekend in December 2017. 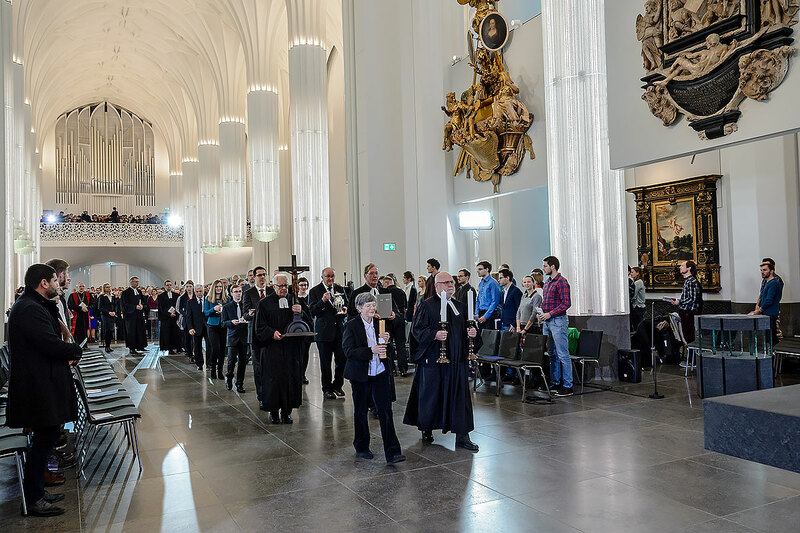 Dr. Carsten Renzing, Bishop of the Evangelical Lutheran Church of Saxony, sees the building as one “which in its formal design recalls the previous building that was destroyed, and translates it into our time”. It is also a space where “learning and faith can meet”.